Local lore says that if you run around the church clockwise three times, then enter the church and stand by the altar, you will see the devil. 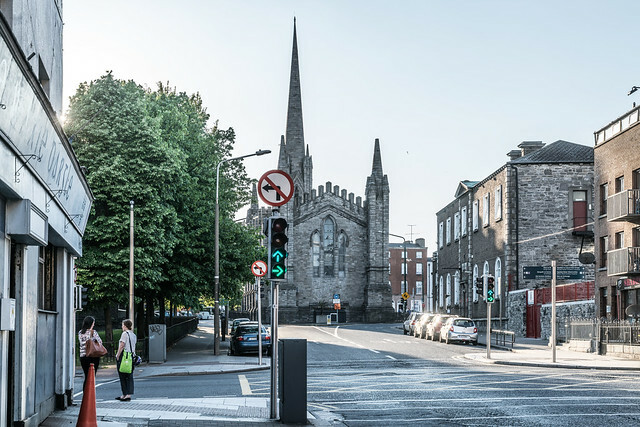 St Mary's Chapel of Ease, also known as "The Black Church", is a former chapel in Dublin, Ireland. Now deconsecrated, it was a church of the Church of Ireland located on St Mary's Place, Broadstone, Dublin. It is constructed from local calp limestone which takes on a dark hue when wet. This is the origin of the building's nickname. A chapel of ease is a church building, other than a parish church, that is located within the bounds of a parish for the convenience of those who cannot conveniently reach the main church. The parish's main church, now also deconsecrated, was St Mary's on Mary Street.